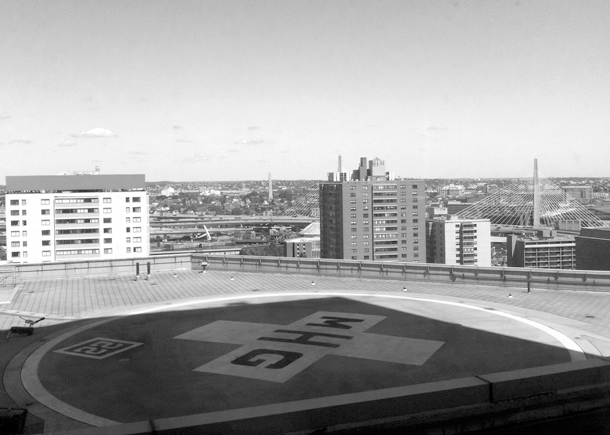 The helicopter pad at Mass General. Surprisingly, I sort of miss that chaotic place. Okay. I think I'm ready to go back to work. No, it isn't because Alice is knee-deep in the terrible-twos and driving me bonkers or that I'm sick of my gig as a stay-at-home mom. It's more simple than that. Earlier in the week I just woke up thinking, "Okay. I want to be a nurse again." I've missed certain things about having a career such as having a schedule and interacting with other adults and brushing my teeth before noon but mostly, I've been happy with my choice to stay at home with Alice for the last two years. It hasn't been easy, of course, but overall I wouldn't do things any differently. The other reason this is coming up for me is that my registered nursing license expires in less than two weeks, reminding me that I haven't worked as a nurse in almost two years. Yikes. That's a long time in a profession that relies entirely upon using knowledge and skills to take care of another human. So yesterday I brushed the cobwebs and lyrics to Dora... out of my brain and did three hours worth of continuing education, which is just a small chunk of the 45 total hours that I will need to keep my license current while not working in a clinical setting. It felt really good to spend that time using my brain in that way again. And it reminded me that I've missed being a nurse and taking care of sick people. I'm sure after my first drunk patient pukes all over me, I'll feel a bit differently, though. Oh wow, that's such a big realisation. I think you'll really enjoy doing both, being a mum & a nurse. With all the time off we've had lately, I went a little crazy being on 24 hours a day. I know we had a little more stressful situation going on as well, but it sure has been nice being back at work for three days these past two weeks. I've decided to add on an extra day of work. I tend to get really grumpy come Sunday & I think that extra day of work will ease the grumpiness making our little home a little more happy over the weekend. So go for it. Nurse & Mum, yay! You must do what makes you happy! Congratulations on getting that head start to go back! I have always been inspired by you and your posts... and when I think that I am going to graduate from Nursing school in 4.5 months... I am only hoping that I will be the kind of nurse that you are. Alice is adorable, and I think she will also benefit from some time away from Mama that is more consistent. Good luck with the CEU's!! CVICU is hiring :))) Come work with me!!! !